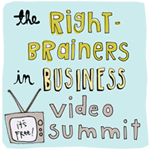 It’s hard to believe that the 4th annual Right-Brainers in Business Video Summit has come and gone! We had thousands of creative souls gather around our virtual circle. Several of our participants have attended all 4 summits and we welcomed lots of new folks, too, who finally found their home with us right-brainers. We celebrated the launch of my second book Building Your Business the Right-Brain Way, each day I did some teaching from the new material, and we learned so much from our guest experts. We wrapped up week 2 on Friday and it was an absolutely amazing way to close out this incredible event. Here are a few quotes from our vibrant chat room from our final day. JuliaAM: Jenn challenged us to “sell something” to pay for Premium. I figured out how to do that and was able to come up with the money. AND I raised my price so I’ll have a profit. That’s crazy! tekpoet: Thank you! I had the time of my life with you! Want to get a taste of what the event was like? You can watch the week 2 highlights video above to see practical and inspiring tips from Melanie Duncan, Beth Barany, Cory Huff, Susan Miller, Christine Kane, Alexandra Franzen, Kiala Givehand, and Marney Makridakis. Christine Kane who took us deep into the spiritual side of business AND gave us practical systems and suggestions for creating sustainable success. She described the process of upleveling and how it’s an evolution of your soul and your business!) Plus I had a fun, experiential surprise exercise that was for some one of the biggest shifts for them at the summit. Alexandra Franzen who gave us a simple structure for introducing yourself. 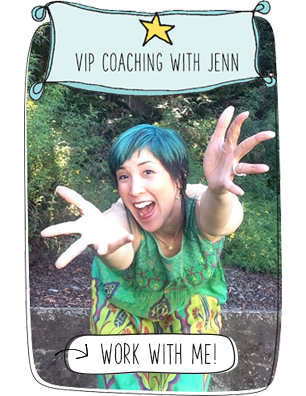 The structures she shared helped spark new ways of people articulating what they do. I’ve heard some great intros now from the folks sharing in the Premium group! We also had our last live Show and Tell Spotlight with Shooting Star Kiala Givehand who was LIVE and in-person in my creative space. You’re going to be so inspired by this incredible woman of action. My desk was overflowing with all of her creative products and offerings! Sign-up here to catch these extended replays now before they’re gone!